When you get a new piece of gear that you are going to rely on during a camping trip, you should always test it out at home in the back yard, or at a local park or a friend's place if you do not have a back yard. This is especially crucial for something like a winter sleeping bag. Believe me, I know, because I've been caught at winter camp in a sleeping bag rated to -30C but struggled to keep me warm at a mere -17C. It was definitely a bad choice on my part to have gone to camp with an unknown bag, but my rational at the time was that the bag rating was considerably better than the lowest temperature we were going to see, and that even if the numbers were embellished they would not be embellished by that big of a margin. Well, I was totally wrong on that one but lucky for me I ended up just having a very chilly night and not in great danger. We've been having quite a cold snap here in Ottawa the last couple of weeks, and temperatures have regularly been -20C during the day and below -25C overnight, so I figured it would be a perfect opportunity to test a bag that I bought last year but have not yet had the opportunity to use. Back in the fall I was thinking ahead to testing winter gear and got a bunch of bales of straw delivered mainly to spread out on a part of the yard that has gotten rather muddy over the last couple of years because it was where I had been storing canoes that I was working on. So 6 or 7 bales got spread out liberally across an area maybe 12 feet by 20 feet, where I knew I'd be pitching tents over the course of the winter. I ended up not needed as many bales as I'd purchased and had 8 left over, so decided to use them to make a shelter. The first A-frame design I came up with which you can see at the beginning of the embedded video would have been incredibly warm, but as it turned out that is not what I was looking for. It did not make sense to design a shelter that would result in an environment significantly warmer than the ambient temperature, when my goal is to test a sleeping bag. Also, I am mildly claustrophobic and that design would have been challenging for me to get into since it was quite a tight space. As it turned out I was surprised that the design I ended up using provided as much extra warmth as it did. In the end I made 2 long walls of straw bales with an end wall of snow, and a small opening at the other end. And the whole thing covered in a tarp for a roof. 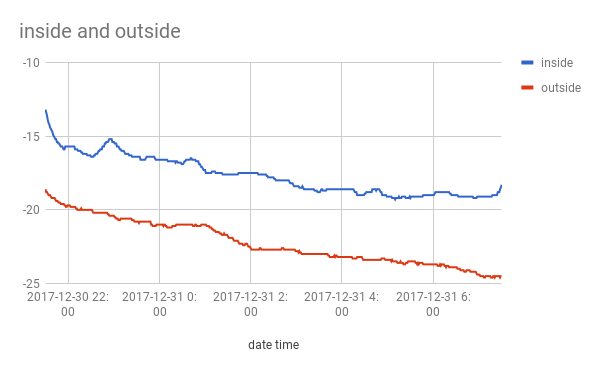 It was my first time trying out my new temperature data loggers so I put one inside the shelter and one outside on a nearby shrub. Here is another post about the loggers. 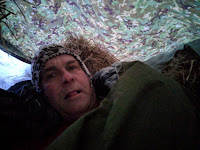 I went out into the shelter around 9pm and got myself settled in with my sleeping bag inside my goretex army surplus bivvy overbag. Expecting to be on the cold side I was wearing a medium weight wool long john, a pair of heavy wool army surplus socks, and a light weight long sleeve merino wool base layer on the top. 60 to 90 minutes into it I was cooking and had to strip off both my socks and the long johns. This was when I noted that the Eureka Amarok provides a great deal of room inside - I was easily able to bring my knees up to my chest to remove my socks and underwear. By that point in time google on my phone was telling me that it was -19C, and the forecast was for a low of -25C that night. Because I was so warm I had a pretty good feeling that this sleeping bag would have no trouble at all handling that low, and indeed I was correct. A critical part of camping out in winter is managing moisture that naturally comes off the body both in terms of perspiration and from your breath, though the moisture from your breath is definitely the much bigger factor. For one, you should never get yourself situated in a way that you are breathing inside your sleeping bag. Even in a chilly fall camp that bottoms out in the 0C range that can be dangerous, but it is especially dangerous when temperatures are far below freezing. Even when breathing outside your bag you will find that ice builds up on the bag around where your mouth is - this is not terrible as long as it stays on the outside of the bag where it belongs. Though it can start to become an issue if you are camping out a number of nights in a row. I ended up not using the hood on my bag - instead I wore an alpaca wool hat with good ear flaps. In hindsight I probably should have worn a balaclava but by the time I'd realized that I was settled away and did not want to get back into the house. It ended up not being that difficult keeping the hat on my head while I slept. Part of why I did not want to use the hood is that I stuffed it with a fleece onesie to use as a pillow, and part because it makes me feel more claustrophobic. Luckily the Eureka Amarok has an inner insulated collar with a drawstring of its own, so I was able to draw that up tight to prevent any air from infiltrating the bag below my neck. When you are looking for a good winter bag that's a feature you definitely want to put high on your list. At a few points during the night as I tossed and turned and assumed different sleeping positions, I had one hand under my head just as I would at home. When I did this I put one of my mittens onto that hand to prevent it from getting frostbite. It worked well. 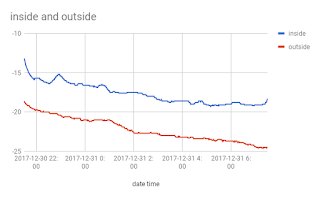 The data I logged from my loggers showed that inside my shelter I was only dealing with -19C though since my head was near the opening it was probably dealing with pretty close to the -25C that the other data logger recorded for a low that night. In closing, I am just loving the new Eureka bag. Especially since I paid under $150 for it taxes in.